The New York Giants have parted ways with Victor Cruz and Rashad Jennings. The Giants will now make a legitimate run at re-signing Jason Pierre-Paul. The New York Giants have made a pair of critical decisions that created roughly $10 million in cap space. After weeks of deliberation, general manager Jerry Reese chose to part ways with wide receiver Victor Cruz and running back Rashad Jennings. 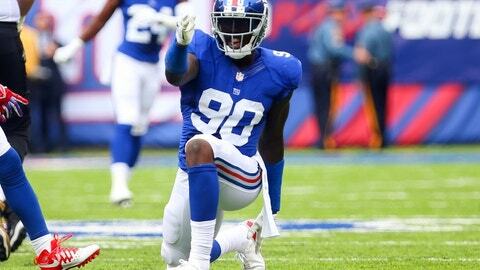 Though somewhat expected, the maneuvers have enabled the Giants to make a run at re-signing another high-profile team member: Jason Pierre-Paul. Pierre-Paul, 28, is coming off of one of the best seasons of his NFL career. He recorded 53 tackles, 7.0 sacks, three forced fumbles, and one fumble recovery in 12 appearances, and ranked No. 13 amongst edge defenders on Pro Football Focus. During a recent appearance on NFL Network’s Up To The Minute Live, Mike Garafolo revealed that the Giants will attempt to re-sign Pierre-Paul before he can hit the open market. That’s a critical development as a definitive offseason nears for Reese and the Giants. Pierre-Paul has spent the past seven seasons playing for the Giants. The dilemma facing Reese, however, is that the seven-year veteran is seeking a contract that could be out of New York’s price range. The decision to part ways with both Cruz and Jennings could create enough cap space for the Giants to bring Pierre-Paul back. There’s no guaranteeing that the Giants will orchestrate a deal, but the possibility now exists for such a result to transpire. Pierre-Paul is rumored to be interested in receiving the same type of contract as fellow Giants defensive end Olivier Vernon. For those unfamiliar, Vernon signed a five-year deal worth $85 million during the 2016 offseason. If the Giants were to re-sign Pierre-Paul to an identical contract, they’d be paying $34 million per season to their two defensive ends. Nothing is imminent, but the New York Giants and Jason Pierre-Paul could soon enter discussions about a new deal.